Britain has its fair proportion of politicians known to act in a cringeworthy manner. There’s Mark Harper, the table-dancing Tory Minister who fell off the table and broke his foot. There’s John Redwood (Tory Secretary of State for Wales at the time), pretending to sing the Welsh National Anthem, whilst clearly having no clue as to the words. Ron Davies MP, caught at a well-known gay cruising ground who subsequently claimed he was “badger watching”. (“Todger watching” seems more likely.) And then there’s anything that Boris Johnson has ever said or done. However, Thailand’s MPs do their very best to be cringeworthy to an equally high international standard. Nattawut Saikua is one of the leading Red Shirt rabble-rousers responsible for the horrendous rallies in Bangkok that resulted in 90 or so dead and shopping malls burnt down in 2010. As a reward for his actions he was made a government minister by Prime Minister Yingluck Shinawatra’s puppet-master brother-in-exile. In fact, he’s now the Deputy Commerce Minister. One of his functions is to promote buying from traditional shops. He felt the best way to do this was to release a video on Youtube, complete with accompanying dancing commerce officials and shopkeepers. As for me, it just makes me want to curl up and die. 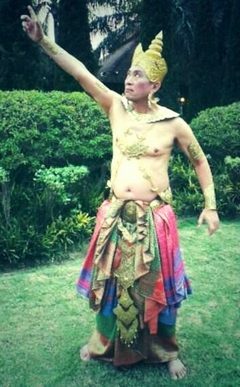 Deputy Prime Minister Plodprasop was perhaps more cringeworthy when he decided to take the leading role in a drama about King Mangrai in front of delegates to this year’s Asia-Pacific Water Summit. King Mangrai founded the Northern Thai kingdom of Lanna in the 13th century and moved its first capital to Chiang Mai when the original capital was flooded. This was a full-on production with hundreds of extras and full set at the ruined city of Wiang Kun Kam (the first capital). Such a fine figure of a man! I’m sure the delegates were thrilled by his appearance and have come to hold Thailand and its fine politicians in even higher regard.